Post 548 on page 55 has some details on the stub switch. Page 43 has some pictures of yard track in progress. Will have to find time to do a track tutorial. Thought I had posted one before but do not recall when or where. I use balsa for ties as it is soft before finishing. I scrape the full length of a strip of balsa and then cut into tie lengths. I use an exacto to further distress the ends for splits etc. I glue them down with white glue. After the glue has set I paint them with artists acrylic raw umber. Then dry brushed with white. 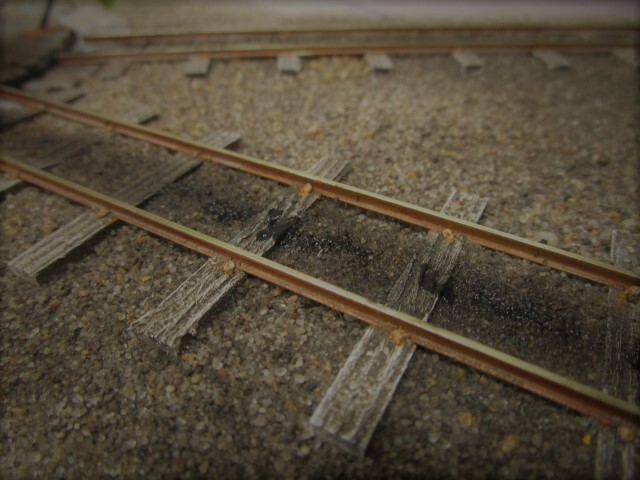 Rails are glued in place with Walthers Goo (contact cement). I add spikes but mostly for appearance only. Rail sides are painted with Model Master acrylic Rust. Finally rails are dry brushed with raw sienna. I find that after paint and ballast glue etc the balsa ties are plenty strong. Look at Page 61, post 605 and 606. I've been poking around looking at old photos. I found a prototype for your round buffers in this photo.